The TL;DR version of this article: Recreational GPS units are useful for giving reasonable accuracy in location, giving elevation and tracking overall pace. Recreational GPS units are not suitable for providing accurate total distance covered. The mileage on the odometer, if you will, is often on the higher side. As much as 10% in some cases. GIS professionals also use much more expensive devices for a good reason. And have the software, education, and training to use the data correctly. Read this excellent article for more information. A few weeks ago, my friends and I did an off-trail option of a popular backpacking route. The route went over an unnamed passed and was more technically challenging than the traditional all trail route. But this route was shorter mileage wise as we did not have to drop into a valley and climb again. We took a straight shot that hugged the Continental Divide for a bit and then into a valley. One friend brought along a mileage tracker. At the end of the hike, he reported we did the same mileage as if we did the trail route. That made no sense. How could that be? Recently, I received a polite, friendly but firm email saying that the mileage I had reported from mapping software is off. He and his friends had GPSd a route I suggested, and it was five miles longer than what my mapping software reports. The same email suggested I update my mileage reported to reflect the accuracy of their GPS units. Is that correct? And in the racing world, professionally surveyed half-marathon routes of 13.1 miles are called too short by people wearing GPS enabled devices. Some people less politely and less friendly, but still firmly, write the race directors and complain that the race course is 13.9 miles or even 14.2 miles. Some racers even are LESS polite and sued the race director. :O Why? Because their GPS enabled devices report higher mileage than what is on the race course. What is going on here? Is mapping software, professionally surveyed courses or established maps less accurate than GPS enabled devices? Are people hiking or running more than reported on known trails, routes or races? It is because what professional GIS and surveyor folks call Recreational Grade GPS units are not the most accurate for measuring distance or mapping in general. A consumer grade GPS is excellent for plotting out, more or less, where you are. And it is useful for making notes of where something may be in a general sense. Surveying, plotting out a location, measuring distance and taking other accurate measurement is not going to be done by your phone or what is found at REI, however. Professionals use much more expensive devices for a good reason. And have the software, education, and training to use the data correctly. Collectively as a culture, we tend to put our trust in technology. What are on those GPS unit displays must be accurate is a general thought. But, as with all technology, it must be used appropriately and within the limitations of said technology. Note: I am not a GIS professional. I’ve included links that you should read for a much more in-depth understanding of the technology. This article is just a high-level overview from a backpacking and hiking point of view. This link, in particular, is very instructive and is one I suggest reading. The article is written by a GIS professional who is also an avid racer. Myron Avery on Katahdin with a measuring wheel. From the Maine Appalachian Trail Club. Back in the day, a measuring wheel was used to gauge distance on a road, race course or backcountry trail. And of course traditional survey equipment as well as the mapping portion. Both the wheel and traditional surveying equipment are still used depending on what needs to be done. Backpack-mounted survey class GPS with an antenna. From NOAA. re-doing distances on well-known hiking trails, a Survey Class GPS will be used. The GPS units are used when absolute accuracy is needed. And the data collected is merely the raw data. A GIS professional has to process the data correctly with software and use the appropriate services to ensure that resulting data is, in fact, accurate. Less expensive models or without accessories such as the antenna pictured in the photo may cost $2000 or more. The higher end and extremely accurate ones with such accessories as the antenna will be closer to $10,000 in total cost…or even more! The software and services that do the processing may be an added expense as well. Much training, experience, and education are needed to make efficient use of these tools. When reasonably accurate information is needed, or perhaps some quick updates have to be done, the Mapping Grade GPS is used. These units are more portable and are more battery efficient versus Survey Grade GPS units. They are rugged for the field and often used on hikes to a location. The Map Grade and Survey Grade GPS units often blur together in utilization and functionality esp as the higher end Mapping Grade GPS units are bought. Prices range from roughly $1000 up to $10,000. Your GPS-enabled watch, a GPS unit such as one bought at outdoor stores or an increasingly frequently used mobile devices are all Recreational Grade GPS units. They are good for knowing, more or less, where you are in a general location. You will not get pinpoint accuracy for location or distance. The effects of this inaccuracy are more noticeable the longer or more varied a jaunt. Within their limitations, a Recreation Grade GPS is just fine for what most of us would use such a device for An augment to traditional navigation aids. These devices cost $500 or less typically. Various device photos from Amazon. I’ll summarize the differences into one cute statement. If you want to know what road you are on, use Recreation Grade GPS. If you want to know what side of the road you are on, use Mapping Grade GPS. If you want to be able to accurately recreate each lane line on the road you are on, use Survey Grade GPS. So explain why does my Recreational Grade GPS devices not give accurate distances traveled? As you can guess, it is telling that the fact that professional surveyors and GIS professionals use expensive equipment along with expensive software and services to make use of the GPS data. Plus these individuals will have extensive education, training, and experience to accurately take advantage of the specialized data, services, software, and equipment. The statistics are just not in favor of GPS when it’s being used to collect distances. This thread from Views from The Top has a helpful discussion about the GPS technology from a backpacker’s perspective. Besides being less accurate regarding meters, the Recreational Grade GPS is primarily using heuristic software and fuzzy logic to process the data it receives. People much more intelligent than I can explain it better and in more detail. But, in essence, the Recreational Grade GPS units use built-in software to primarily interpret the less accurate data (vs. commercial GPS units) it is receiving for you. Remember, Jane GIS uses her experience and education along with expensive equipment and software to achieve accurate results that are used for your race course, property boundaries or hiking maps. There is no 100% reliable way for a [Recreational Grade] GPS to differentiate between slow movement in a small area and being stationary. As such, the manufacturer’s have to guess at some heuristics (ad hoc algorithms) and thresholds which result in different characteristics–the Magellans in question appear to have a higher threshold for separating the two states than Garmin. This may result is a prettier, but less accurate track which skips zones of slow movement (ie data is thrown away). In practice, the fuzz balls may not be pretty, but they do tell the knowledgeable user what happened. There used to be a similar issue with what to do if the GPS lost satellite signals. Some (Magellans, IIRC) would extrapolate (ie guess) the track while the Garmins would declare a loss of signal. However, the extrapolated track was often wildly inaccurate… This also led some users to erroneously think that these GPSes were more sensitive than the Garmins. Yes. Your Recreational Grade GPS, besides trying to intelligently fill in the gaps of data, may also “track” you even while you are sitting still. The GPS is also extrapolating data based on the last time it pinged the satellites. 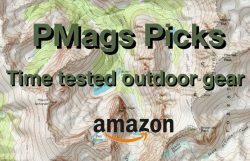 Which can be less than optimal in certain terrain found in the backcountry. The longer the hike, run or bike ride and the more varied the terrain, the less accurate the GPS measurement for distance will be. Even something as simple as where the GPS enabled device is worn or carried can affect the accuracy of the data. Many people are now using Recreational Grade GPS units while racing. Many racers complain that professionally surveyed race courses are listed as being shorter than what their GPS reports. So many complaints that the race directors have to address these concerns directly. This document from a marathon is interesting and gives an excellent overview of the issue. Math being my strong point, lets look at a final ingredient, That 1:44 marathoner ran for about 6,240 seconds. Over that period if his GPS sampled every 5 seconds that will provide 1,248 samples over a half marathon course. The certifier will record 211,290 points or clicks on the counter over the same course – or almost 200 times as many. Because most devices collect positions at a high frequency—though this can vary based on the brand as well as the current position of GPS satellites—Ranacher and his coauthors found it more likely that distance will be overestimated when using GPS technology. For their study, published in the International Journal of Geographical Information Science, a participant walked on a premeasured track with a GPS device that collected positions every second. For several of the trials, the distance was overestimated by as much as 10 percent, Ranacher said. Now, if using a GPS during a measured road race or even a simple track gives exaggerated mileage info, imagine what hiking with trees, mountains, canyons, a lot of twists and turns with ups and downs will do to Recreational GPS figures? So what good is the $200 tool I just bought? To paraphrase a linked article, your GPS is a great tool for hikes, for figuring out approximately where you are in the mountains, tracing a route to map or plot out for later use along with elevation and pacing charts. And it is an excellent tool for those uses. The mileage traveled in a short period may be OK.
Just don’t use a Recreational GPS expecting an accurate measurement of distance traveled over the long haul. Sorry. I know I walked further than what the maps, guides or race director said!!!! Besides putting faith in electronic gadgets, we tend to think we did more than what was done. That wind blew just a bit harder. The climbs are just a bit steeper. And the mileage walked a tad longer. At the end of the day, we are tired, so the miles do seem longer. And people seem to forget that ELEVATION GAIN and ELEVATION LOSS will significantly impact hiking time. A steep climb or descent will take longer and be more taxing on the body. Needless to say, the rough terrain will make a hike longer and more arduous, too. 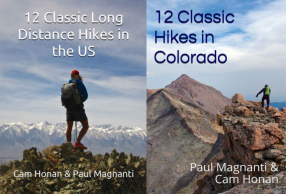 At least for me, I tend to think of the number of hours hiked versus miles hiked. Experience and being able to gauge trail vs. non-trail, elevation gain, terrain hiked and attempted mileage gives me a reasonable measurement of what can be accomplished in a given time. So how do I get a reasonably accurate set of figures for distances hiked? Many recreational hiking maps will already have the distances listed of course. And official park, government sites or similar will have distances published. However, if you are doing obscure areas or hiking off trail, many mapping resources will allow you to trace a route and will show mileage figures. The smaller Lost Creek loop that started this whole discussion. But a trace is not entirely accurate, either. A trace will not get the nooks and crannies of the trail. And few people follow a hiking trail 100% as laid down on the map. Here is a rule of thumb I learned many years ago to get a reasonably accurate account of distances hiked or planning to hike: Do your trace with mapping software and then add a ten-percent fudge factor. In the example above, the map trace was 19.x miles. Add 10%? You get 21.X miles. Round up slightly to 22 miles. Voila! Is this method accurate? Not 100% of course. But I think it is more accurate than a Recreational GPS with all the quirks discussed above by many people I quoted from the links. Among these people are GIS professionals and research scientists. Or people who are wicked smaht as I would say growing up. So there you go. Recreational GPS units are a fantastic piece of technology. They have their uses for backpackers, and with government maps declining in overall practical use, these tools have made open source mapping a realistic endeavor. But like any tool, they must be used wisely and within its limitations. Love that pic of Myron Avery and friends atop Big K.
I have no comments on GPS for backpacking. Did you notice the Sierra Cup hanging from the belt of the guy holding the measuring wheel on K? Did not notice it until you pointed it out! Good catch. It surprises me how much inaccuracy there seems to be. If my GPS knows my position within fifteen feet, there shouldn’t be a half mile discrepancy over fifteen miles. One thing that has kept me from using my recreational GPS for serious mapping is the fact that it measures distance in miles. The bulk of the discrepancy may be in rounding errors. I wonder what the differences would be if you kept track of your position periodically and then plotted the locations after you got back. You would need to locate the points of major changes in direction and elevation. If your track has lots of ups and downs, your actual distance would probably be greater than your track indicates. I think for the type of measurement you propose, you’d really need a professional level GPS unit. Based on what I read, the consumer level GPS units don’t really cut it for measuring distance overall. Several years ago, I needed to do some surveying/mapping, mainly how far from here to there and how many feet up or down. I didn’t want to use surveying equipment as that would have been too much precision. I had a Garmin eTrex Vista, but it was just too imprecise for what I was doing. I was using portable pumps and needed to know the length of the pipeline and the gravity head to predict performance. I had topographic maps, but these were too imprecise for my needs. I was aware of the limitations of the equipment, but just couldn’t justify the added expense of more precise equipment. If a GPS can calculate my position to within 15 feet of my actual position, it can do a better job of tracking my path. The manufacturers evidently don’t consider this to be important. With the move to smartphones for most navigation, I wonder how the recreational GPS market is doing. My biggest problem with the GPS units that I have used has been battery life. When left on in tracking mode, my Vista would use a set of AA cells in a day. Battery power is the Achilles heel of a lot electronics. I know the military is putting a lot of R&D into batteries for that reason. One thing that I didn’t see mentioned about the races, was that most people do actually run farther than the “advertised” length. This is because they don’t run the shortest possible route, and that is what is measured for the race. If you run in the pack and get stuck on the outside of a turn, you run a lot farther than the guy on the inside. The race articles mention that. Not to the extent that the GPS incorrectly reports…and the converse is also true: People don’t run the longest possible route either. More competitive runners of course know this vs recreational runners and are experienced enough to optimize their running. Yep…I make a general rule to multiply my hiking GPS distance number by 0.9 to get to a more accurate distance. This seems to be pretty accurate to within 1-2% for me. Recreational GPS units measure distances finely – inappropriately finely given the amount of noise in the signal. 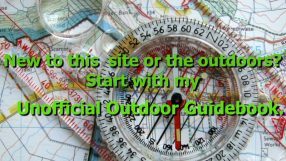 You can actually get quite good results – certainly adequate for putting the distances in a trail guidebook – from a smartphone GPS, but you need some sophistication to do it. If your track log doesn’t include all the data about signal quality (received signal strength, circular error probable, horizontal and vertical dilution of position…) it will be much more of a challenge to clean it up. The trick is to take the track log, smooth it, and then interpolate it on the scale of a surveyor’s chain or measuring wheel, because that’s the “gold standard” for distance traveled, whatever a more precise instrument measures. I did http://www.nptrail.org/?page_id=59 that way, and it matches the guidebook distances pretty darned closely except where the trail has been relocated or the guidebook has obvious mistakes. (There was one place where the guidebook simply appears to have got the figure wrong and come out exactly a mile short.) I don’t trust the last digit of the mileage one bit. I included it for calculation because I was accumulating roundoff errors otherwise. And it’s sure easier to have one guy walk a trail with a smartphone and external battery than to have a four-person crew with alidade, planetable, sighting rod, and chain or wheel. EDIT: And when professional surveyors measure distance for something non-legally binding, they use the mapping grade GPS..which are rather portable. I was told the GPS unit Half Mile used for their PCT app was a very expensive custom one they develped. Do you have any info on this? What about Gut Hooks? Thanks for the enlightening article. The app and the mileage data they use are going to be two different things I believe. Atlas Guides (Guthook) uses Jerry Brown’s (Bear Creek Survey) GIS data for the CT and CDT apps from what I understand. Not as sure about Half Mile where he gets his data from as the source. Makes a big difference then. The experience and knowledge to go with the high-end equipment too as well. As an aside, most of the mileage issues come from people doing their own tracking and questioning established routes or races. Not so much questioning of apps and its data by people who know what they are doing. My Garmin seems to be accurate to .01mile with traile mile markers on a three mile hike. Why isn’t it overstating as others do? Without more data on that trail, hard to say. Three miles is short, though, compared to the examples noted by others however and the controlled experiments done by scientists.